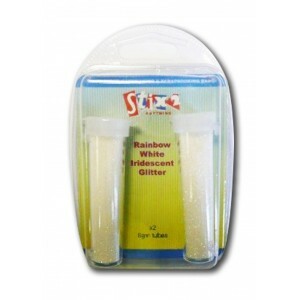 This is the glitter I remember from my Hallmark Greetings Card days! I use this for glttered highlights. Personally I prefer it to coloured gltters. It also gives exactly the same effect as the manufactured cards that you see on the shelf in shops. Use sparingly on Weddings, Christmas, Anniversaries... looks fantastic on the "Squeezee Snowmen"
Use it with the PVA glue which dries clear... perfect! A must for the serious digital Crafter!